When it comes to having staying power in the home building industry, the ladic.info team knows a thing or two about what it takes. After all, we’ve been in business for more than four decades! A big part of it recognizing the importance of constant evolution; you can’t stay the same, offering the same designs and floorplans, and expect to keep attracting customers year after year. That’s why we’re constantly updating our offering, and are thrilled to share the latest: brand new farmhouse elevation styles being offered for our Montgomery, Covington, Camden, Cedar Hill, and Hampton floorplans. The Farmhouse elevation alters the roof pitch, and adds a reverse gable at the garage for a country-style look. Both windows on the front are a generous 6’ high and the window grids are done in a farmhouse style. Notice also the cedar Z-batten shutters with black hinge straps, as well as vertical board and batten siding, and a rectangular gable vent in the garage gable. The garage door is a Charleston panel with Stockbridge style windows in the top panel, and since details are important, it includes decorative hardware. The garage door also includes a shed roof above with trim down the sides of the door. A stone foundation wrap is added across the entire front of the home, and the entry door has been changed to a craftsman style fiberglass door. You’ll love the porch added to the front, featuring cedar wrap columns with cedar brackets. Love light? We’ve got some for you! The windows on the front of bedrooms 2 and 3 of this home are now single windows, and all 3 windows on the front of the second floor are framed by a wide trim for a bolder statement. The twin windows in laundry room and den are both changed to pairs of singles windows that are each 6’ high to let in a ton of light. The window grids are a farmhouse style and the front of the home features vertical board and batten siding, including the garage gable and garage return wall. The garage door is in a Lexington style and also includes a shed roof above with trim down the sides, plus that decorative hardware we mentioned. A stone foundation wrap is added across the entire front, including the porch return wall. The front door is a craftsman style fiberglass door with craftsman style sidelights, and a 6’ deep porch stretches across the front of the laundry, foyer, and den. The porch includes cedar wrap columns with cedar brackets and a black aluminum railing. The Farmhouse elevation for this home increases the main roof pitch to make a bolder statement, and all of the windows on the front are now 6’ tall instead of 5’ to let in more light and create a more country style look. The window grids are also farmhouse style and the front of the home features vertical board and batten siding, including the garage gable and garage return wall. A cedar gable bracket can be found at the garage gable, and the garage door includes decorative hardware along with a trim surround. A stone foundation wrap is added across the entire front and the front door is also the craftsman style door we’ve mentioned. You’ll love the porch across the front of the dining room and foyer, as well as across the front of the living room. The porch includes cedar wrap columns with cedar brackets and black aluminum railing for added style! 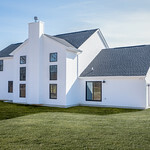 The Farmhouse elevation for this home means the home features vertical board and batten siding on the front, as well as horizontal trim to separate the vertical siding from the horizontal siding in the gable. The twin window in the living room is split into two single windows that are 6’ tall for added light and a bold statement. The twin window in bedroom 2 and in the master is split into two single windows, and the master features another, third window too! All window grids feature a farmhouse look, and a shed roof is added over the garage door with trim down the sides of the door. The garage door changes to a Lexington panel with Stockbridge style windows in the top panel along with decorative hardware, and the stone foundation wrap across the entire front of the home adds even more detail and character. The front door has been changed to a craftsman style fiberglass door, and a front porch is added across the front of the living room. The porch is accented by cedar wrap columns with cedar brackets. In this new elevation, the dining room window and master bedroom window have changed to 8’ wide by 6’ high triple windows to create a huge and bright statement. The foyer window is an impressive 6’ wide by 4’6” high twin window, and a picture window is added to the gable of the garage for even more character. The front of the home features vertical board and batten siding, and a shed roof is added above the twin window in the loft. A shed roof is also added over the garage door with trim down the sides of the door. The garage door is paneled and features windows along the top panel for added character, and the stone foundation wrap across the entire front really ties everything together. Cedar gable brackets have been added to all three front gables of the home, and the front door is a beautiful fiberglass craftsman-style one. 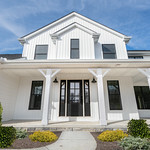 The generous front porch is now 2’ deeper and extended across the front of the master bedroom, making it 6’ deep at the master bedroom and dining room and 8’ deep at the foyer—you’ll love hanging out there! We know you’ll love this rustic, homey look for your future home, and now it’s available in even more custom floorplans. We can’t wait to show you the farmhouse elevations in person, along with all the other styles you have to choose from. Get in touch today to talk about the possibilities!